On Sept 26, 2009, I got a text from my Dad that they were stranded in the hospital (dialysis and blood transfusion) because of Typhoon Ondoy, international code Ketsana. From that time on I prayed that all will be safe. My brothers were on their way to get my parents when they had to leave the car because the water level rose rapidly. In 30 minutes the water level rose tremendously since 3 dams were opened to prevent from breaking. However, the citizens didn’t have enough time. My two brothers walked for hours to get to the house to ensure my Mom’s pets’ safety. The water was already up to their waist. My brothers didn’t know what they were stepping on…Fortunately, my parents’ home was not damaged and my mom’s puppies and dogs were safe. One of my other brothers was desperately trying to save his bike shop. The water got into the shop, while my other brother with his infant son ( I have 4 brothers in the Philippines) was in his apartment in the 2nd floor. My uncle’s family had to go on top of their roof since the water was as high as 5 feet; I still have not heard from my other uncle whose house might have been totally damaged. Unlike other Filipinos who lost all their belongings, homes and lives, we are grateful my family survived another challenge. Filipinos have strong faith. And no matter how challenging life can be, Filipinos still manage to smile, move on and even lend a helping hand. The Philippine National Red Cross is accepting donations. I pray that the donations will go directly to those who need it most and not to the corrupt politicians. Please pray for all those affected by the typhoon. Please click here to watch a You Tube video on Typhoon Ketsana's . Click here to check out a charitable event in NJ (to benefit the victims) . Please visit http://www.ondoyrelief.org/ for details on how you can help! strong winds and maybe less brain. Dead bodies that were found hanging on trees, under the mud and under the bridge. Let us pray for those families that were hit by the storm. 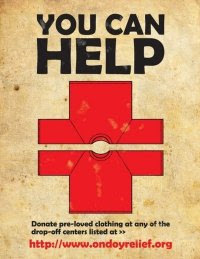 If you can donate anything - clothes, money, please do so. Prompt for the week: Do you view life as half-empty or half-full? Praying for your family and for all others who are affected. Hi Jenjen! I'm praying for your family and all the others who are affected. It is a hard time right now, coupled with ill economy. I have been praying since I saw it from the news. And you're right, we must pray that the donations will go to those who truly need the help, not to the corrupt politicians. Blessings. @Paula, @Veronica @rcubes - Thank you for the prayers. Philippines truly need it. Glad to hear your family is alright and I pray that your other uncle is, too. With election time coming up, let's see which of the politicians will rise up and go beyond campaigning and PR purposes and truly reach out from their hearts to help, with no sights set on getting good PR mileage out of helping. JenJen, I'm so happy to hear your family is safe. Have you heard from all your uncle? I'm praying for you all, you are one strong woman!! Oh, Jen - I'm with your son: how much more can they take? I know it's doubly hard on you because you are helpless from so far away. I'll say a prayer that everyone is okay and that they have a peaceful break from all these life challenges. I am so glad your family is safe. I'll be praying for all of you. Oh My...Im so happy to hear your family is well! That has got to be so scary and I pray for them that all will remain safe!!! @Buckeroomama, @Tami, @Felicia, @Pam and @BrnEyedGal - thank you for all your thoughts and prayers! I miss all of you, too!